I thought I'd post this for any Scott Foil owners who have the intergrated handelbars. My Foil came with the 420/110mm version, but I found the 110mm stem measuring closer to 120mm. 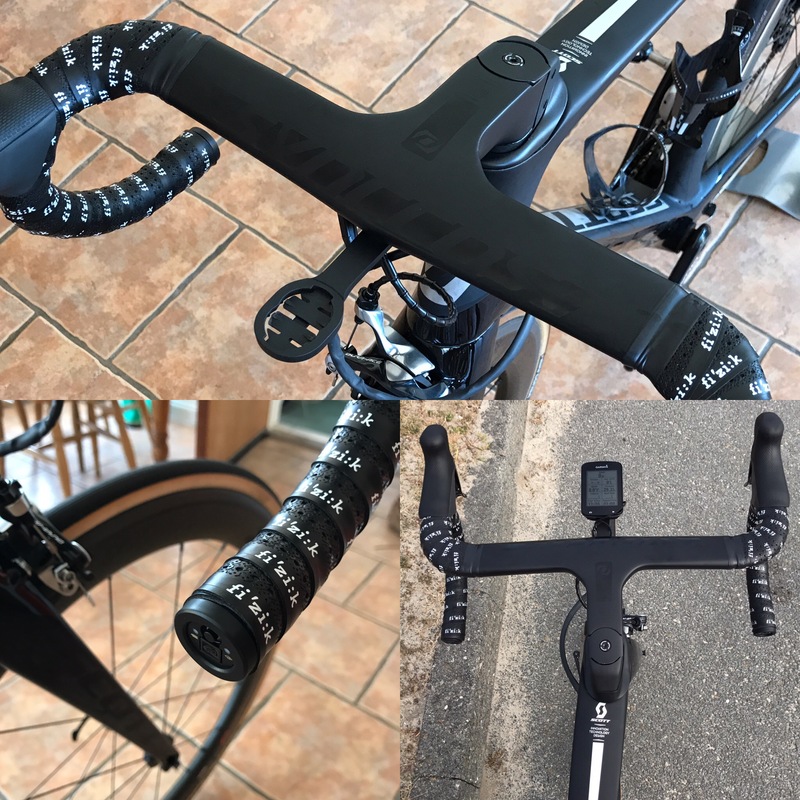 The original handlebars are no longer made, so what turned up caused 1 or 2 issues, mostly 1) The Di2 junction box is no longer under the stem, it's now in the bar end, 2) Due to the first point, the Garmin mount has now changed. Anyway, the Di2 junction box is now the bar end version Di2 EW-RS910, and I also needed a brand new Garmin moint. This time I ordered the 400/100mm version and they fit abolsutly perfectly. I've posted a pic below of the new cockpit. If anyone has any questions, please let me know. I have the original RR1.0 computer mount and an aftermarket one that runs Pioneer/GoPro combo if you guys are interested. p3dalfaster, good catch! I'm running the 420/110 and noticed something was a bit off. The 400 is just too narrow for me. Btw, is your stem top cap flipped in the first photo? dlcrep wrote: I have the original RR1.0 computer mount and an aftermarket one that runs Pioneer/GoPro combo if you guys are interested. p3dalfaster, good catch! I'm running the 420/110 and noticed something was a bit off. It said that it is of the first kind, but I was not sure if I was looking at the right thing. It doesn't look right. The 400 is just too narrow for me. Btw, is your stem top cap flipped in the first photo? in your opinion, which one is better, the original or the aftermarket? Last edited by yourdh on Fri Jul 07, 2017 2:42 am, edited 1 time in total. Your bike is really cool. I found the same problem in length! When you measure the center line of the stem bolt to the end of the handlebar and subtract the average handelbar width/2, you get somewhere in the neighborhood of stem length at 118mm for a "100 mm" Stem. So you bought the 2017 handlebar and somehow moved your Di2 charging box to the handlebar, and changed the garmin mount? That is exactly what I would like to do! Go to the 100mm/420 handlebar and move the di2 box to the handelbar end. Does the new bar use the standard splayd mount like the one from K-dege, the only one I saw from scott was for a garmin and I run a wahoo. The original is definitely cleaner but if you need a combo mount for a GoPro/light attachment, Rec-Mounts is your only choice. I did like that the computer sat slightly closer with the Rec mount. If you have access to tooling, you can probably add a K-edge adapter beneath the OE mount. Scott Foil owners, need your opinions.